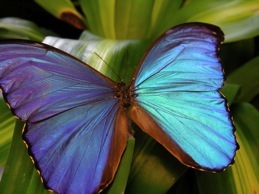 The Blue Morpho butterfly is an iridescent blue butterfly common to central and South America. David Hammond, University of Vermont, Physics Department. Butterflies are covered with scales (in the case of the Blue Morpho these scales are about .000060 meters [60 micrometers, 1,833 S/D] wide.) that give them their wide variety of colors because of physical structures or pigmentation. Butterfly scales are divided into three categories, Type I scales that have structures that are shaped like Christmas trees, with the “branches” of cuticle and air layers between branches forming a multilayer. Type II scales are made of alternating continuous layers of cuticle and air forming a multilayer. Type III scales consist of arrays of holes in cuticle - much like the holes in a sponge. This is referred to as a photonic crystal. The three butterflies you will be examining are examples from each of these categories. Because of the way these scales are structured, they will share common physical effects such as multilayer thin film interference, and diffraction to produce the colors you see. Use the following links to bypass pages you have already viewed. It is recommended that you progress through the pages in order.